An award-winning, moving, and timely story about the families of undocumented workers by renowned author Julia Alvarez. After Tyler’s father is injured in a tractor accident, his family is forced to hire migrant Mexican workers to help save their Vermont farm from foreclosure. Tyler isn’t sure what to make of these workers. Are they undocumented? And what about the three daughters, particularly Mari, the oldest, who is proud of her Mexican heritage but also increasingly connected to her American life. Her family lives in constant fear of being discovered by the authorities and sent back to the poverty they left behind in Mexico. Can Tyler and Mari find a way to be friends despite their differences? In a novel full of hope, but with no easy answers, Julia Alvarez weaves a beautiful and timely story that will stay with readers long after they finish it. Julia Alvarez is the award-winning author of How the García Girls Lost Their Accents and In the Time of the Butterflies. 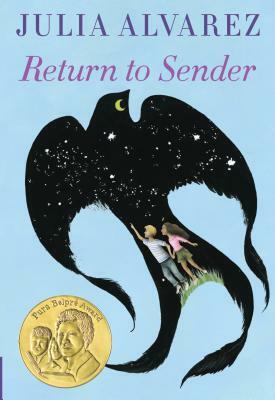 Her highly acclaimed books for young readers include The Secret Footprints, A Gift of Gracias, the Tía Lola series, Finding Miracles, and Return to Sender. Alvarez has won numerous awards for her work, including the Pura Belpré and Américas awards for her children’s books, the Hispanic Heritage Award in Literature, and the F. Scott Fitzgerald Award for Outstanding Achievement in American Literature. In 2013, she was awarded the National Medal of Arts by President Obama. She is currently a writer-in-residence at Middlebury College and, together with her husband, Bill Eichner, established Alta Gracia, a sustainable coffee farm/literacy center in the Dominican Republic. Visit her on the Web at juliaalvarez.com.